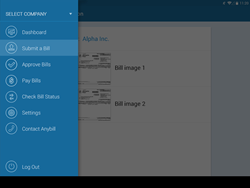 Accounts payable automation provider Anybill announces the availability of its new Android app on Google Play. The app allows Android users to submit, approve, and pay bills from any location using their Android device. Part of Anybill's strength is that busy professionals can manage invoices, submit, approve, or pay bills from anywhere. With the app...you can do everything that you do online on your Anroid. Anybill, a leading provider of cloud-based accounts payable (AP) solutions, announced today the availability of its Android app on Google Play. Now, Anybill users can access their data and manage their accounts payable process from their Android device. Anybill’s cloud-based solution streamlines the AP process. Users submit bills directly to Anybill. Bills are then routed through predetermined approval workflows and scheduled for payment. Payments are then processed complete with remittance advice. Anybill’s Android app is now available on Google Play. For iPhone users, there is also an iOS version available. Founded in 2001, Anybill provides end-to-end accounts payable automation and tax payment services for small to medium enterprises (SME), as well as some of the world's largest corporations and organizations, encompassing a variety of industries. Anybill's cloud-based platform automates the accounts payable process, from invoice receipt and data capture, to approval and payment. It provides clear control and visibility over the entire AP process with complete transparency, robust reporting, and data integration with accounting solutions. The company is headquartered in Washington, DC, and is SSAE 16 SOC compliant.